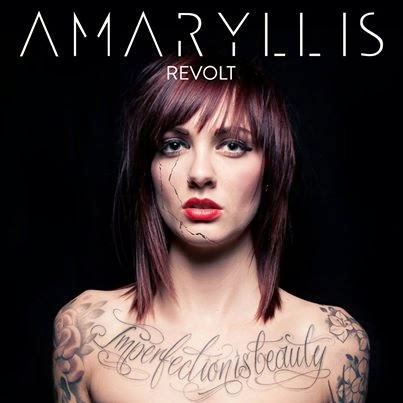 Amaryllis is a female fronted five pieces from London consisting of Sante Moonie (Vocals), Alex Whiteford (Guitar), Daniel Harris (Guitar), Alex Osborne (Bass) and Michael Mann ( Drums) the band have toured with Elliot Minor and The Dirty Youth. Revolt (8) kicks off with “Kings” and the squeal of feedback launching into a high register riff, followed by an undertow of chugging guitars, later joined by lead singer, Sante’s melodic voice. Sante vocal attack changes for “Stand Down”, half chanting, half singing the politically charged lyrics with passion. The song has a feel of slower paced female fronted Rise Against, building up to its thunderous ending. “Prophecies” is harder edged track with bouncy guitars which complement Sante’s call & response verses and catchy “woah” chorus. “Goodbye”starts with a beautiful guitar solo before, Sante’s multi tracked, laid back vocals are set perfectly to the swirling guitars. The EP ends on the beautiful semi acoustic "Strangers in August", a song reminiscent of “High and Dry” by Radiohead. Amaryllis have proven with this release, that they can produce a set of lyrically intelligent songs with stunning guitar work, interesting musical passages and unique vocals. This band is a must for fans of Funeral For A Friend, Tonight Alive, Deftones, Biffy Clyro and You Me At Six. Revolt will be released on the 12th May 2014.